Don’t you just hate trying to find stocking stuffers for your kids that won’t end up in the garbage a few days later or accidentally get thrown out with the wrapping paper? Stocking stuffers need to be small enough to fit into the stocking, if they don’t then it might as well be another another gift. 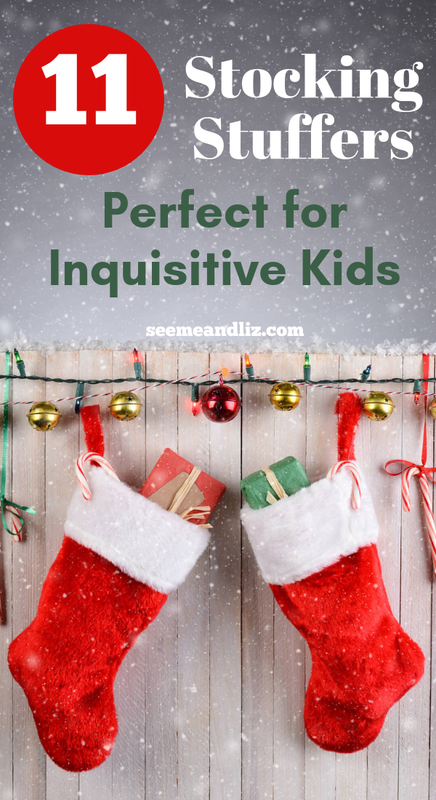 Since I love telling you about toys that are exceptional for a child’s learning and development I will list stocking stuffer ideas that your kids will enjoy and hopefully also learn a bit from. As an added bonus, these little finds are all under $20. Spirographs are a fun way to get artistic without having to be good at art! And if you travel and hate how much time your kids spend on screens this is a way to keep them occupied in the car, on a plane or even riding the train! This spirograph is recommended for children ages 5+. There are many different kinds available and there are some theme based ones. My son had a Thomas The Train one when he was around 3 or 4. Projector flashlights can be used for storytelling and creative play which makes them wonderful from a language development perspective. And something like this may also help your little one get over a fear of the dark. Because it makes being in the dark so much more fun! I have worked with many Occupational Therapists during my career as a Speech-Language Pathologist and they always swore by Wikki Sticks. They used them for everything including working on fine motor development, kinesthetic learning activities, visual discrimination, fidget tools, etc. And for older children they can be used as a handwriting tool. But as a stocking stuffer, Wikki Stix are fun! Children can use their imaginations to make different shapes or items such as flowers, animals, etc. They are also a must have for long flights or car rides! One thing to note, they are not great for toddlers as these sticks (which are sticky) will probably end up stuck to their clothes, the carpet or even the wall, which will cause them to lose their stickiness pretty quickly. So if you plan on purchasing these for a toddler, supervision is probably a good idea. And the sticky wax could easily be chewed off. Another favorite in our house. If you have a dinosaur fan at home then this is the perfect stocking stuffer. As we have had several of these, I can tell you that it does take work to chip away at the “rock” surrounding the fossil. This will really be a test of your child’s attention span. In order to keep them at it, start discussions about dinosaurs and where they may have lived and died to end up in a fossil. Ask them if they think the dinosaur bones they are digging for are from a real dinosaur or not, and why or why not. Be prepared for a mess, so get out an old tablecloth and have your child sit on the tablecloth on the floor. If it is really testing his patience you can try submerging it in water for a few minutes to loosen and soften the sand. Just a note that this is a 3 pack, so it will work well if you have more than one child. Or you will have 2 spares on hand. Either way this is an awesome stocking stuffer! Your child can work on fine motor and language skills all while having fun. For younger children talk about the parts of the snowman (eyes, carrot nose, sticks for arms, snowballs). Talk about the actions you are using to make the snowman such as rolling, stacking, poking, squishing, etc. If your child gets bored of making the same old snowman over and over again, why not try making a melted snowman, or some other kind of creature/animal. These would also be pretty cool party favors if you are having a Frozen themed birthday party! These cute little guys are actually a two in one “toy”. It’s an eraser and a puzzle as they come apart (hint, not meant for children under 3). These ninjas come as a 3 pack! Do you remember the game Simon? Now there is a mini version available and is recommended for children ages 8 and up. With the memory maze game your children can challenge their short term memory by trying to remember the sequence that the lights are making. A buzzer will sound when a mistake has been made. In addition to being a fantastic stocking stuffer this game is a must have for long car rides! It’s a plant that’s also a zombie. Well not really, but once it has grown (takes a few days for the seeds to sprout) and you touch the leaves, the plant will play dead. But don’t worry, it will come back to life again after a minute or 2. You will get 2 sets here which is also nice. And this is a great opportunity to talk with your child about the life cycle of a plant and what plants need to survive. Ask your child what may be making the plant play dead? Is it really a Zombie? This is another snowman your child can build. It comes with the snowman accessories and the snowballs you can form. And you don’t have to wait for the spring for him to melt. After he has been built sit back and watch him start to melt. Ask your child what may be causing him to melt? Think of other things you can make and then watch them melt. This is also a great way to practice vocabulary words with a younger sibling. Label each item you are putting on the snowman! This may seem like an odd suggestion for a kids stocking stuffer but my kids have these and love them! They use them in their forts, when they pretend to go mining and of course for our family camping trips (both indoor and outdoor ones). There are so many uses for these headlamps that will lead to creative pretend play! Puzzles are a brilliant learning toy and kids don’t even realize they are learning when they are working on one, which is all the better when it comes to a child’s development! There are 4 puzzles that come in this tin. Each puzzle varies in difficulty. I hope that this has taken some pressure off of you and that these really are stocking stuffer ideas kids will be thrilled to find Christmas morning! These are great stocking stuffers for kids! I remember spirograph when I was a kid. I loved it! Simon and the travel spirograph and the others are all things kids would love to find in their stockings. What I like too is that they are unique. 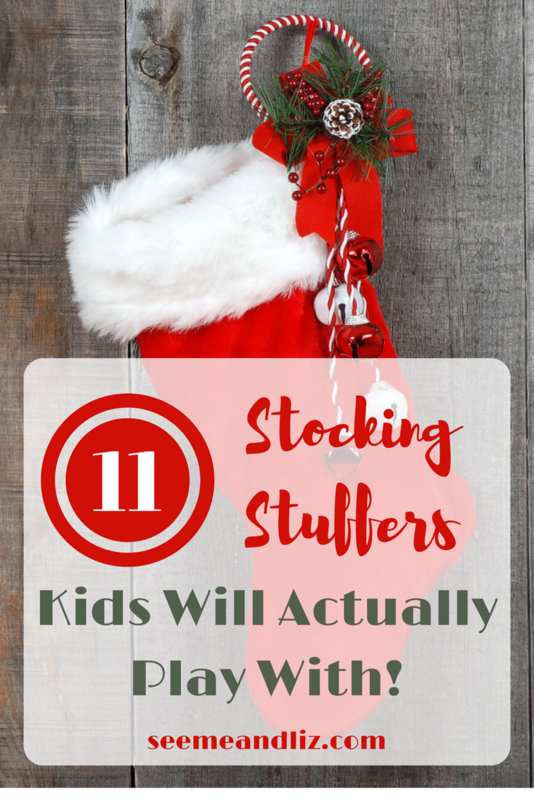 They are not just a toy for a stocking kids might normally find on Christmas morning! I think kids may be so involved with their stocking stuffers and forget the big presents! Great stuff! I had a spirograph too! I had so much fun creating with it. Simon is also a wonderful classic game. I love this small version because it’s great for long road trips! You’re welcome! My kids have received the Dinosaur Fossil Kit in their stockings a few years ago and they both loved it! The Wikki Stix are great too. There are so many things kids can create with those and they are great for strengthening fine motor skills. Tanya, thank you for the great ideas! With the Christmas season coming up very soon, it is very important to start getting gift ideas in order, and this article has definitely benefited me and my search for Stocking Stuffers as well main gifts – perfection! I know of a few, young members of my family that would largely benefit from having such toys in their toy box arsenal, as the same toys have helped my little sister with cognitive functions at a young age, in fact many toys you mentioned are the same ones she had in her early years of grade school and she definitely excelled! Thanks for your comment William! I must say though that as my children are now teenagers I have moved from Xmas morning Stockings to Xmas eve boxes. But I did find some great items in your article that I know my young nephews will love so I will send my sister-in-law the link. She always struggles finding practical stocking stuffers for the boys. 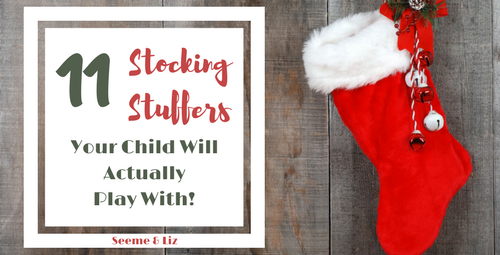 I hope that your sister in law will find some stocking stuffer ideas for her kids on this list! Thanks for sharing it with her. I’ve been looking for new stocking fillers and these are great ideas. Simon is a favorite. Ours broke last year but it’s fun for the kids so I will definitely get another. Is there any other recommendations you have? I love the travel Simon game! It’s great that there is a small version available now. When I was a kid there was only the big one. What are the ages of your kids? That would give me a better idea of stocking stuffer toys to recommend. Thanks Kirsten! It can be challenging to find useful and fun stocking stuffers for kids. I’m done getting stocking stuffers at the dollar store that end up in the garbage a few days later. Wow these are really great ideas for stocking stuffers with Christmas coming up (at an alarming rate!) so thanks for the great information. I like the jigsaw puzzles in a tin and they look perfect for my son who is 3 years old. He is starting to take an interest in things like this. Would that suit his age? He may also enjoy the Spirograph, I remember something like that when I was a kid. I can’t believe how quickly Christmas is creeping up on us. The puzzles could be a bit tricky for a 3 year old, but if you son likes puzzles and can do simple ones then these could provide a nice challenge for him. The Spirograph is also meant more for older children, but there isn’t any reason why a 3 year old can’t give it a try! What about the little projector flashlight? My kids loved those when they were between 3 and 5. Actually, I bet they would still like them (they are 8 and 10 now) if we still had them around. Good luck with your Christmas shopping! If you don’t have Amazon Prime yet, you should look into it. Then you can do last minute shopping but still get your items sent to you within 2 days! I am looking for a Christmas gift for my 33-month-old daughter. She likes small stuffed toys, small figurines, and any character as long as it is small. The ninja erasers look like something she will like. 🙂 However, you specifically stated that it is not for kids below 3. My daughter is only 3 months away from her 3rd birthday. Do you think that’s okay? What makes it not okay for kids below 3? Thanks for your comment and questions Pitin! Your daughter sounds just like my son. But he is 7. He loves all the small figurines and little toys. The reason the Ninja erasers are not recommended for children under 3 is because the erasers are small to begin with (hence their low cost), but when taken apart the pieces are even smaller. This could cause a choking hazard. It really is up to you. If your daughter is used to playing with toys with small pieces then she is probably fine. Or you could make sure to be watching her while playing with them. But if you have any concerns you could always wait a while. Perhaps she would like the head lamp or the flashlight projector. My kids love both of these items and had them when they were around 3. They still love these!